Here is a video of Dr David Shaner of the Ki Society HQ giving a presentation on mind and body unification at a TEDx Talk. He explains how this principle can help you get un-stuck and where it can be applied to your daily life, business or sport. Mind and Body Unification is a central pillar to our practise and is taught explicitly in our classes. In fact, progression through the AIkido grades is only possible where students can demonstrate an understanding of this concept. 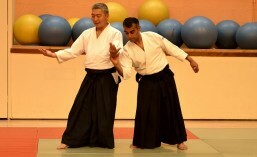 ← AIkido Black Belt Grading from the Nineties.